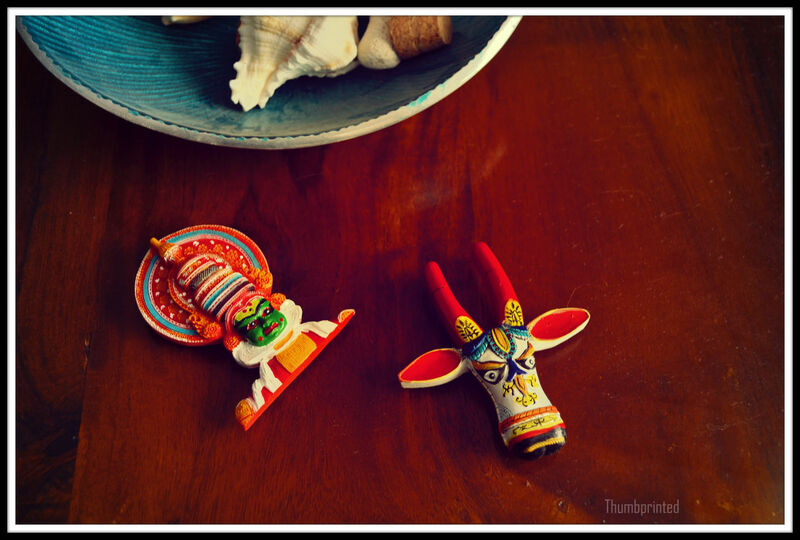 Kathakali (classical dance form originating from Kerala) and traditional cow head fridge magnets done with such eye for detailing. Sometimes while doing up our homes, we realise that it is the small things that capture a big place in our hearts. Like maybe our kid’s doodles / pets’ paw prints or our parent’s black and white photographs or even the simple fridge magnet picked up on travels! 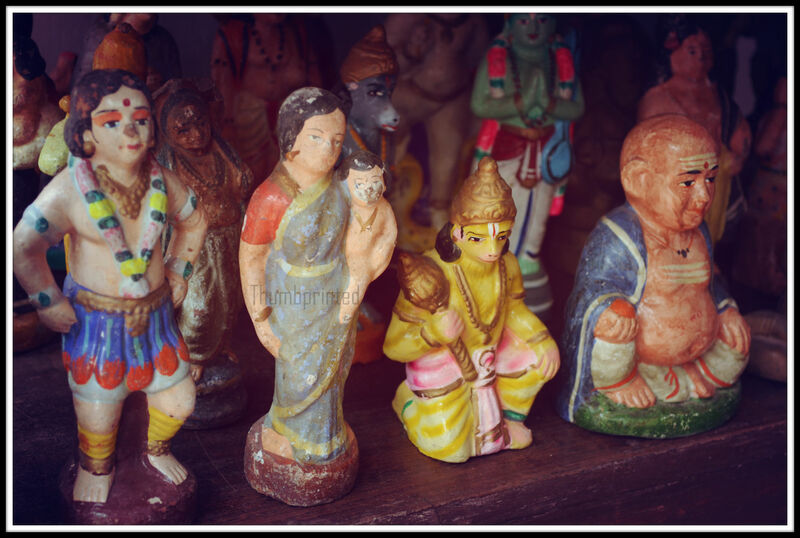 Here are two beautiful fridge magnets we picked up on Jew Street, Cochin. It is true, small is beautiful. Driving away from the metro being constructed on MG road in Cochin to the small yet popular area of Fort Cochin known as Jew Town, I was surprised at how quickly the scene changed before us. 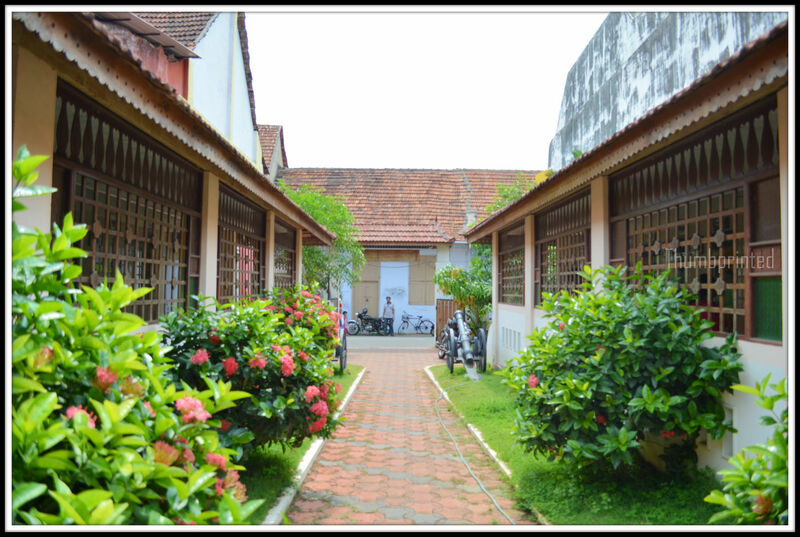 As we drove closer, we could see the waters of the Vembanad lake behind a single row of buildings. In front of us lay neat little streets, with quaint old buildings on other side, built by the Jew settlement after whom the area came to be known as Jew Town. Most of these buildings are shops today, selling various curios. 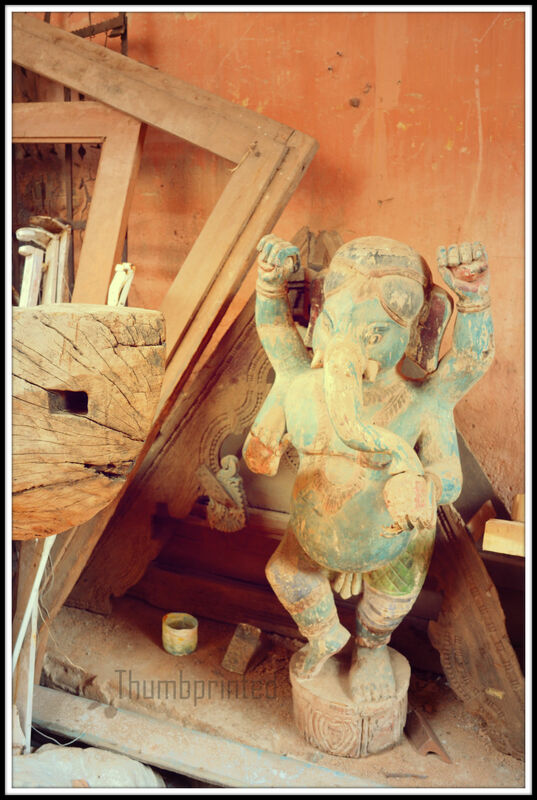 The buildings themselves were fascinating, some that have been built again over the years and boasting of a fresh coat of paint, while certain others showed their age in the frail creaking wooden steps that we were afraid might not hold our weight! The buildings, the shops and their outdoor display were a treat for the senses. 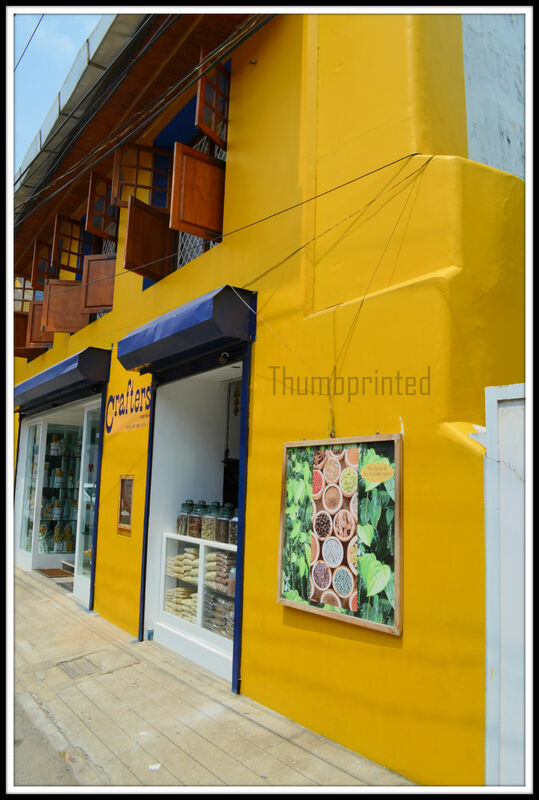 As a brightly painted sunshine yellow facade beckoned us to explore further, so did the aromatic smell of incense wafting from another, and yet another shop with their sacks of spices laid out making our taste buds conjure up exotic dishes! 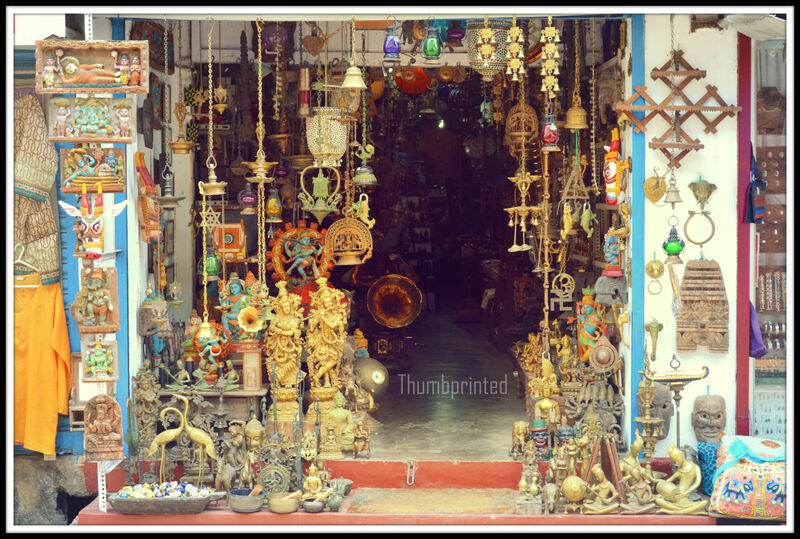 These shops boasted of a range of items from a variety of spices to hand crafted clothing, home decor, vintage finds and a street full of curios. 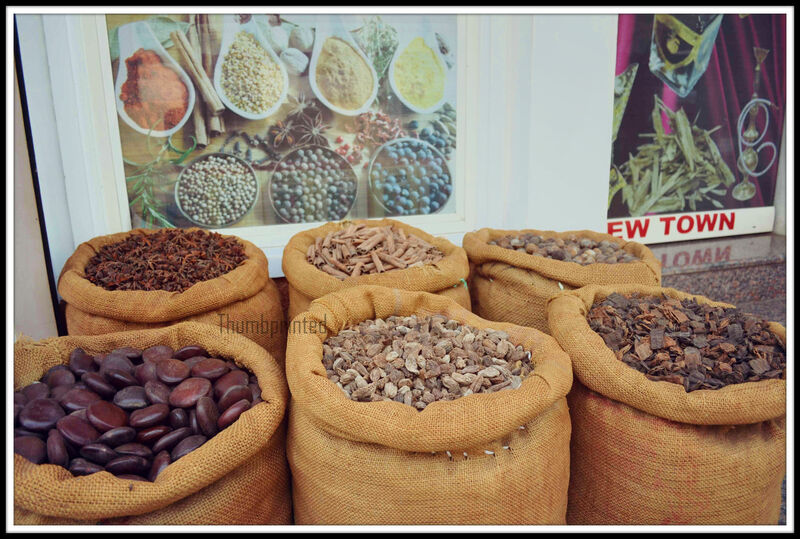 While many items on display are not specific to the town of Cochin or even Kerala, they showcase the rich culture and heritage of India with products from Kashmir to Kanyakumari on display. 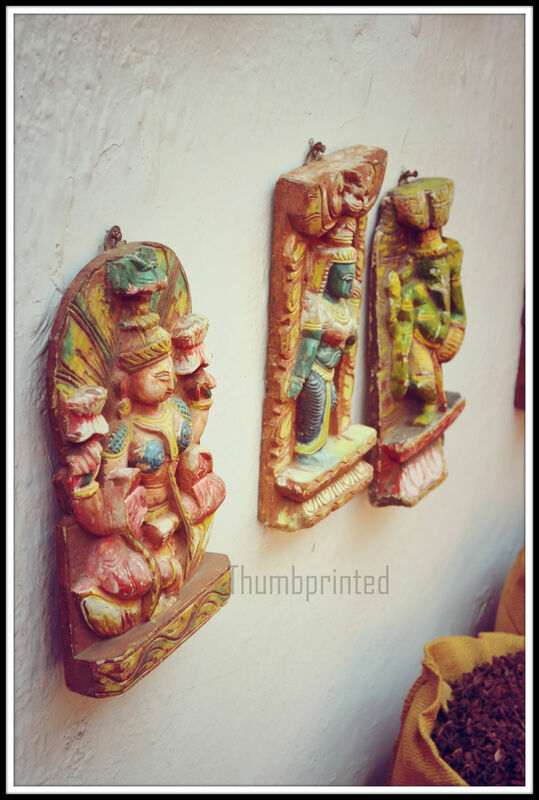 Bright sunny walls with tinges of enticing blue invited us to explore at the Crafters store. 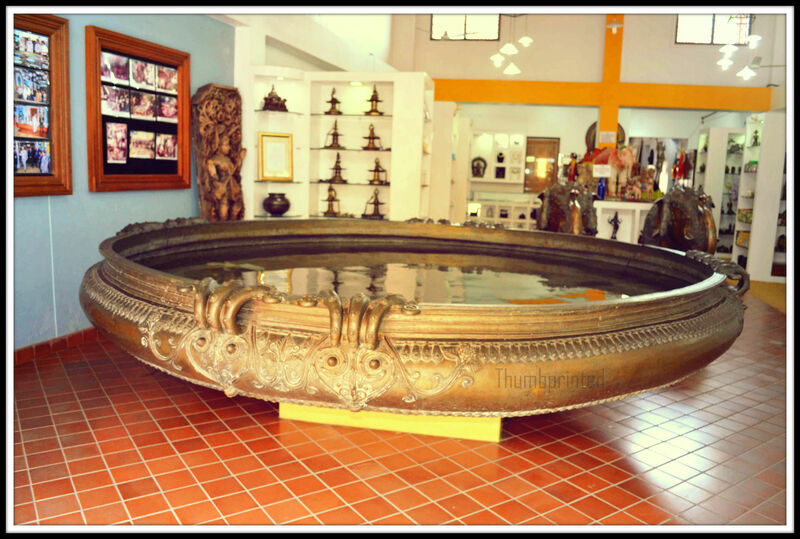 On entry they had a massive Uruli (traditional vessel used for cooking in Kerala, made from bell metal), this holds the Limca Book of Records for the largest Uruli in the world measuring a stunning 12ft in diameter and weighing 3184kgs. Well one thing is for sure you need more cooks and more weight lifters than imaginable to put this stunner to use for cooking! 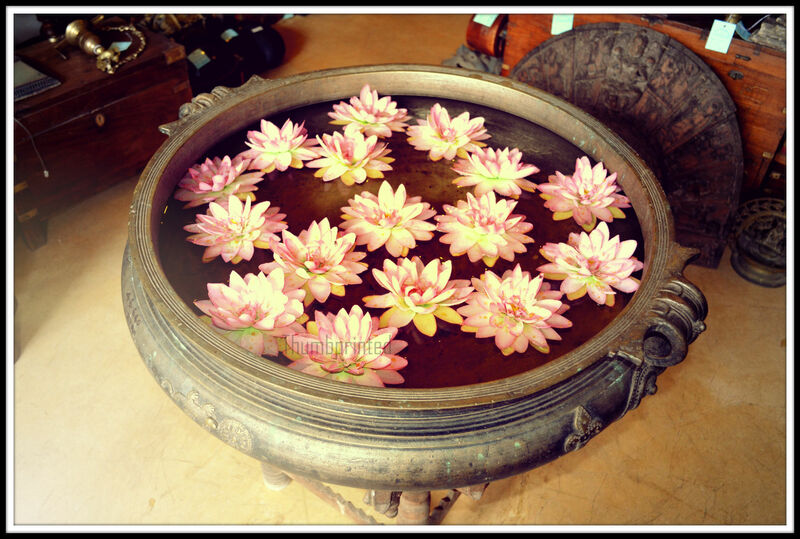 Now Urulis are used beautifully for home decor, popularly displaying flowers floating in water. As we walked on attractive arrangement of various spices outside the shops, led to our discovery of Jew Town’s spice box treasures. 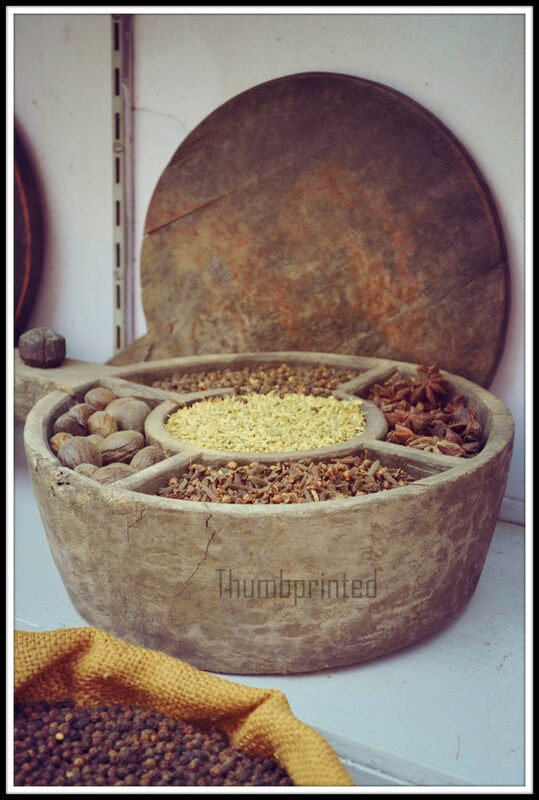 Beautifully made in teak wood (is what some shopkeepers say, but I think it might be made from the wood of jackfruit tree as well) and displaying intricately carved motifs, they were as beautiful as any treasure box 🙂 Some looked charmingly vintage and is a must buy for those interested in traditional utensils and cookware. 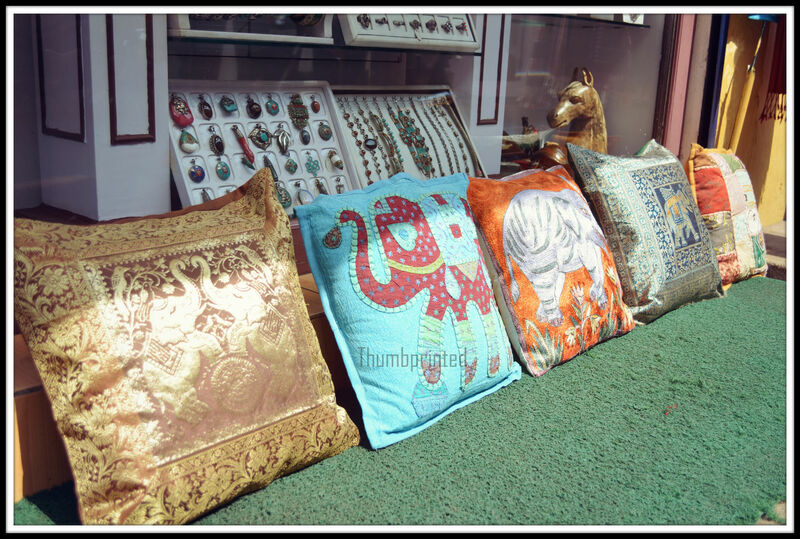 Attractive cushion covers on display outside a shop, some showcasing exquisite handwork embroidery and patchwork. 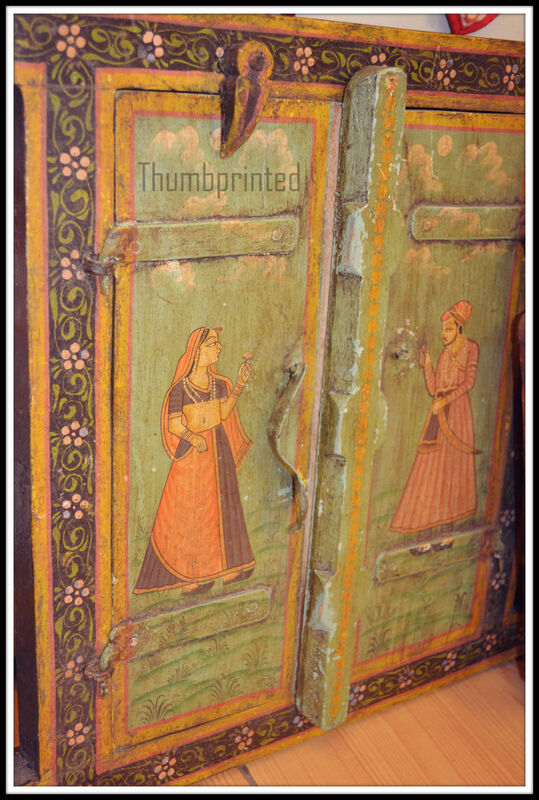 An old window frame and panel with painting in Mughal style. 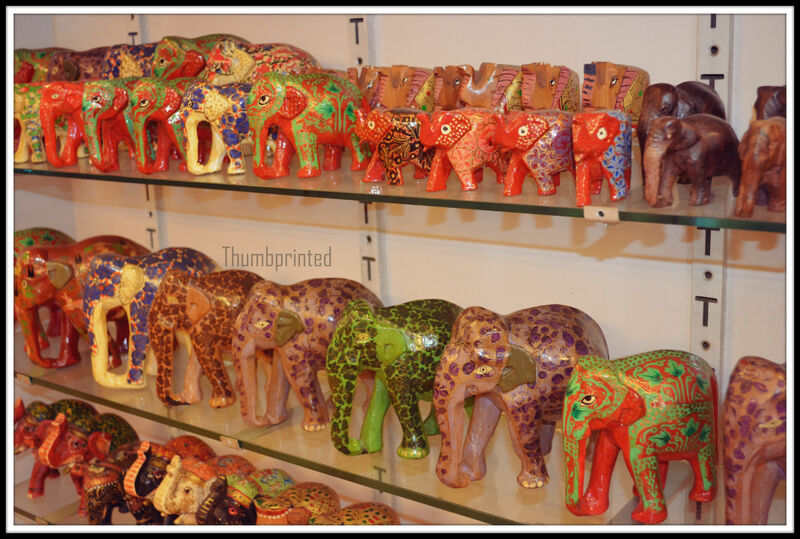 Elephants of all sizes and shades made both from paper mache and sculpted wood, which is then painted vibrantly. 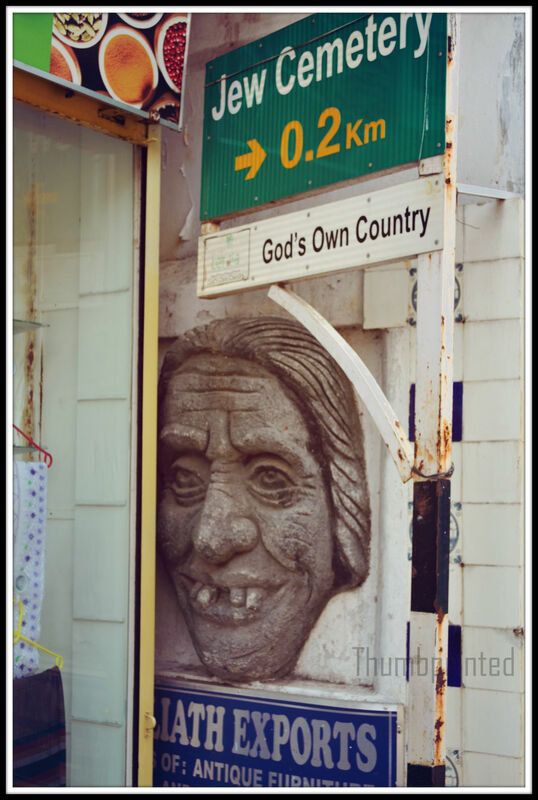 As we stepped out to continue exploring, this signboard and the little scary sculpture on the wall caught our attention. Sculpted face of an old lady with some real crooked teeth, but those eyes are so expressive. I’m in love with these wooden cow heads. 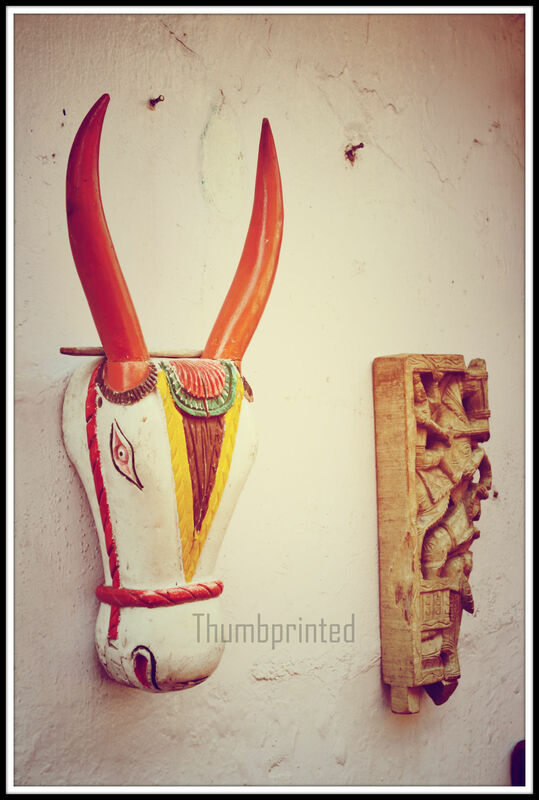 Though they are made a little differently across various parts of southern India, primarily Tamil Nadu and Kerala, these cow heads or Nandi heads prove to be arresting display pieces. 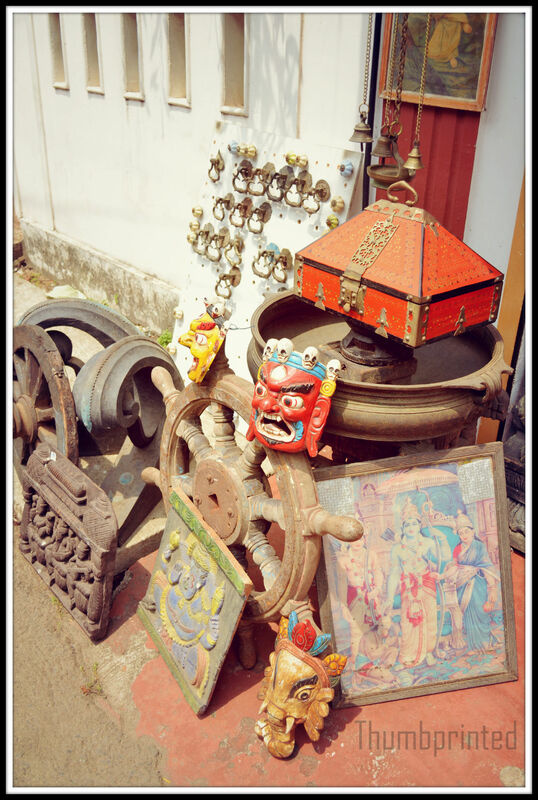 A staggering variety of curios, Thai masks in wood, Kerala style treasure box, traditional Indian utensils and lamps, old portraits of gods, brass door knobs and antiques. Weathered black and white photos of unknown people. The charm of these photos lie in the grey grains that seem to tell stories of a different time. The building had beautiful passages with woodwork and stained glass. The below photo shows a traditional game played across South India, called as Palangulli in Tamil Nadu, as Allugulli Mane in Karnataka and Kerala. 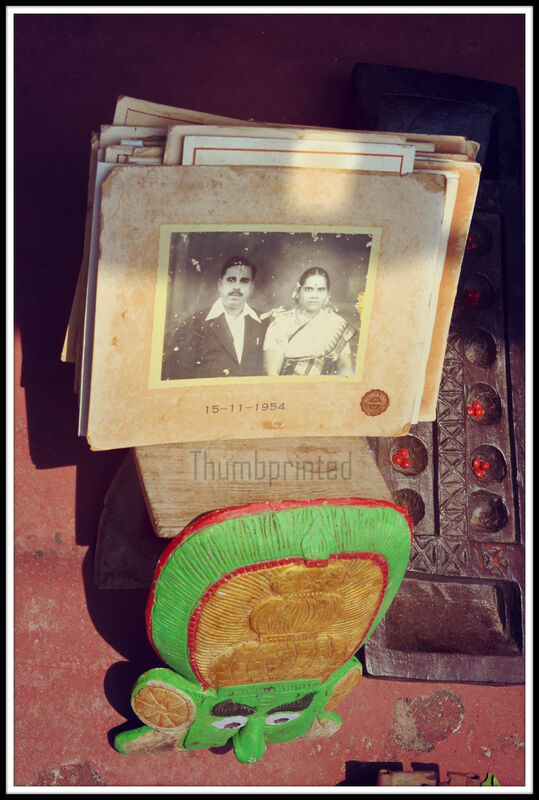 The game board consisting of a wooden board with multiple depressions are available in a range of creative shapes across rural parts of South India even now. 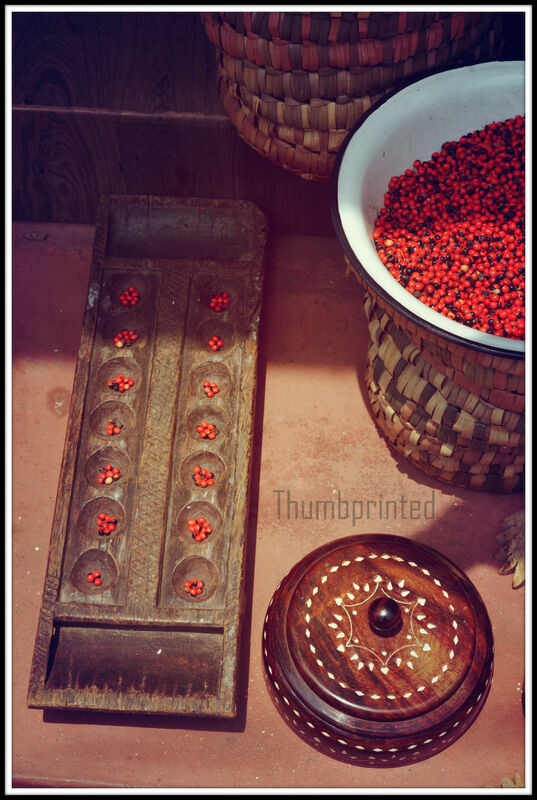 They are played with seeds, coins or even dry fruits 🙂 Initially introduced as a game for the women folk to keep themselves occupied ( from the religious reference that Goddess Sita invented this game in captivity, awaiting rescue), it has come a long way with changes in rules resulting in a game that is challenging to play despite the simple looks. By this time we were quite tired walking around in the hot sun and needed a refreshing drink and walked into what seemed at first look ; an art cafe. After ordering lime ginger juice, we decided to walk around and explore. 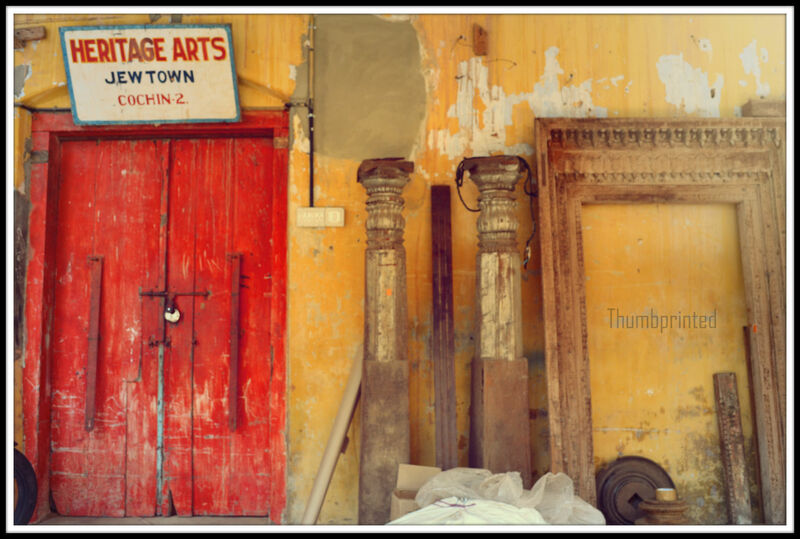 The store Hertiage Arts dealt with paintings, sculptures, vintage and antiques, refurbishing antique doors and pillars and even take orders for furniture. 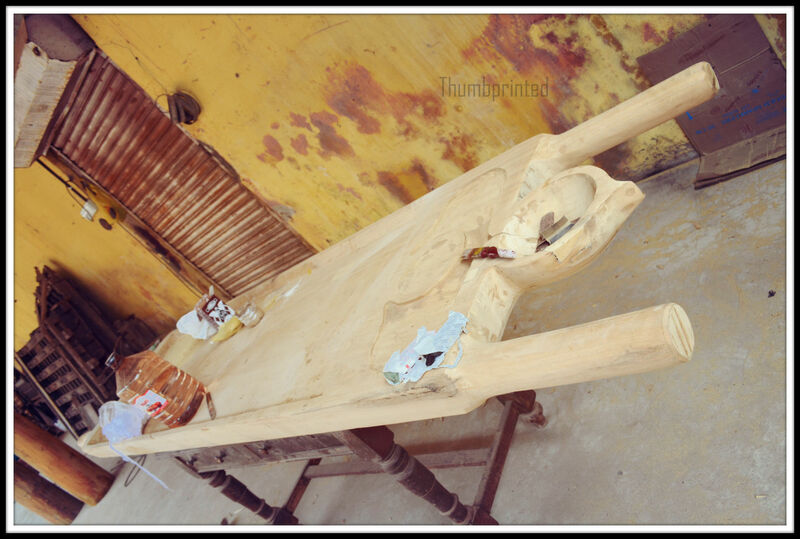 Below they are putting together the gorgeous Ayurvedic massage table. Above a procession of traditional Indian women heading out for some festival or occasion, done in a decoupage style. 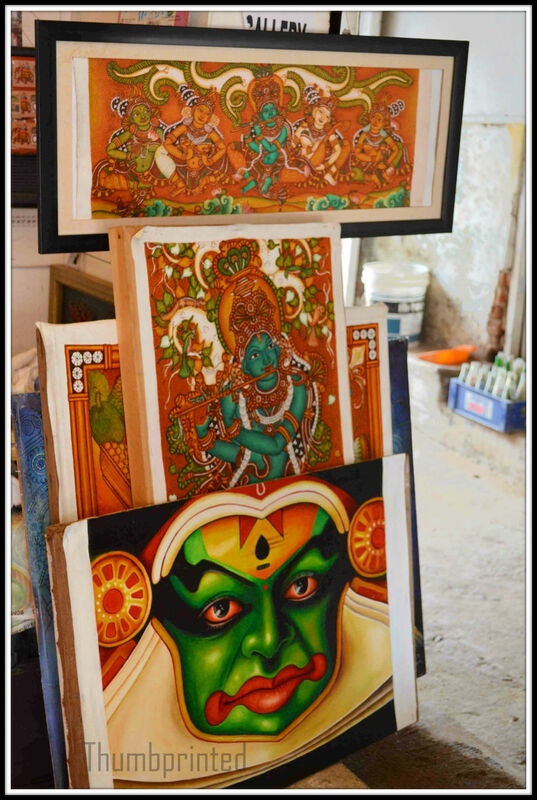 And below are paintings of Kerala Murals and Kathakali (a popular classical dance form). 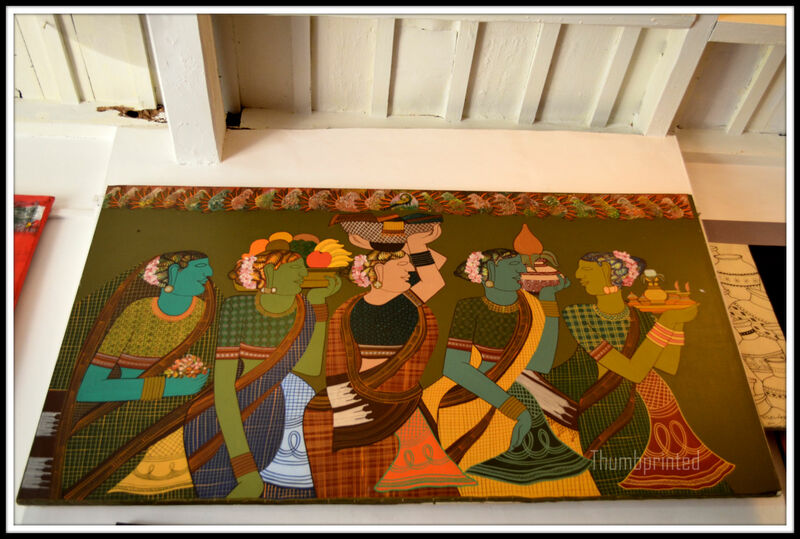 We saw more Kerala murals in the Dutch Palace or the Mattancherry Palace at one end of Jew Street. 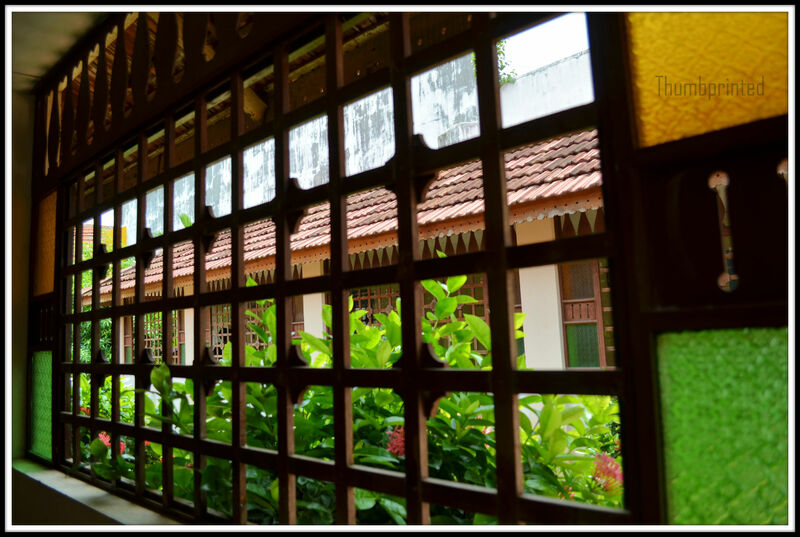 The palace was originally gifted by the Portuguese to the Raja of Cochin in 1555. The Murals depicting Hindu religious scenes are elaborate and rich in colours. However many of the Murals are showing wear and tear with the passing time. Photography is banned due to the delicate state of the paintings. 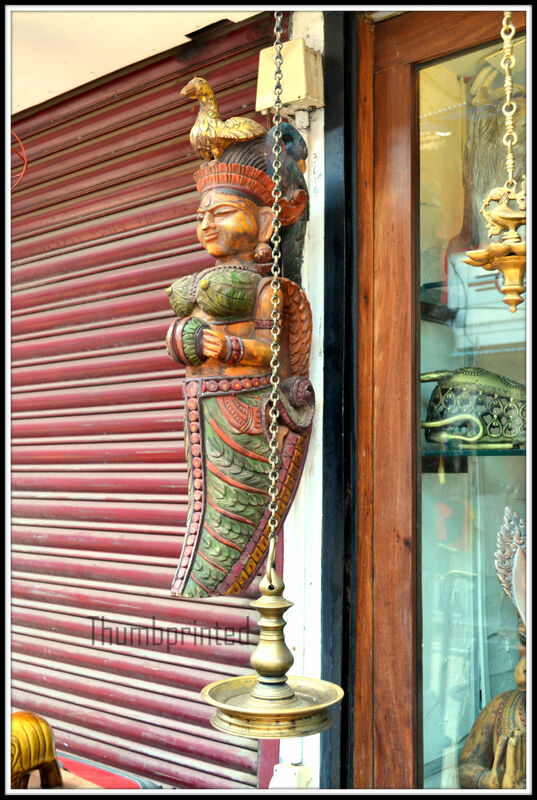 Antique wooden figurine that resembles a mermaid and brass lamps. 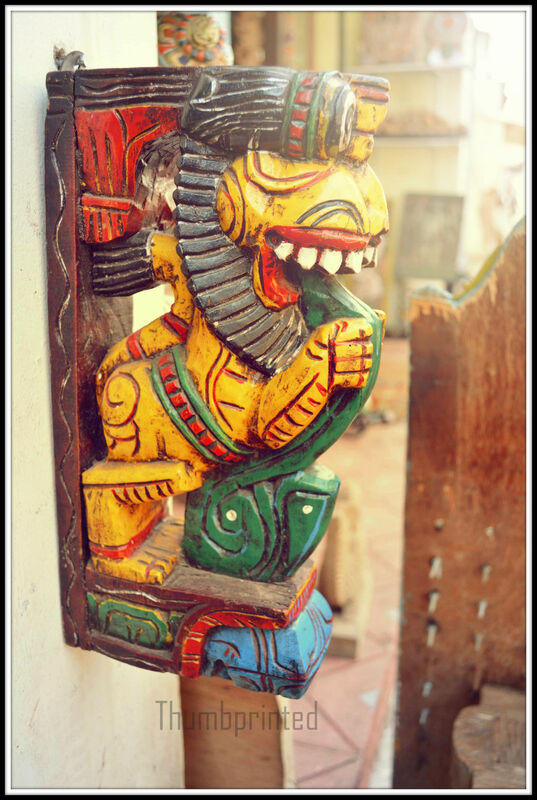 Yali (in tamil) a creature of Hindu mythology, popularly seen guarding temple entrances and sanctum entryways. They are shown to have a catlike body with head of lion and tusks of an elephant and said to be more powerful as well. Lastly, a parting photo of a typical shop at Jew Town. Are you not tempted now to explore this yourself !? And if you are wondering how much damage this caused my wallet, I did buy a few quaint items, though not nearly as many as I really wanted to! Will post some photos of them around my home soon.